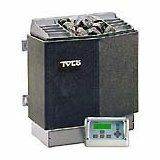 Are Portable Steam Saunas Any Good? Portable steam saunas are an economical and easy way to enjoy the benefits of steam therapy in private. Like full-size saunas, a home steam sauna aims to improve circulation and increase cardiovascular activity by dilating the blood vessels through heat therapy and sweating. A daily or bi-weekly steam sauna session can help you better manage stress, improve your health and feel better all around. That works for sauna rooms and cabins, but what about the portable personal-sized units? 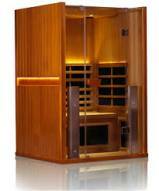 They're certainly very popular and also very affordable, so they're worth looking into if you want to have the sauna experience without the big cabinet. 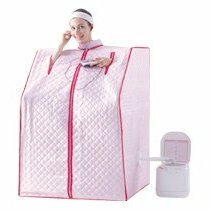 The portable steam saunas are similar to the portable infrared saunas, the only difference is the heating is provided by the steam rather than IR heating panels. The units themselves are typically the same fabric enclosures with a zipper in the front and cut outs for your arms and head. While the infrared heating units are inside the unit, here the steam generator sits outside and pumps steam through a pipe that goes through a hole on the side. Relatively inexpensive. 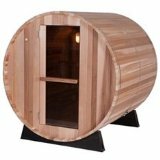 You can purchase one of these saunas for around $100 or less. Compare that to at least $1000 for a traditional 1-2 person sauna and you can really see how much you are saving. Use them anywhere. You're not confined to a particular area with a portable sauna. At only 20 pounds or so, you can move it anywhere in your home, take it with you to a friend's house or even on vacation. Skip the gym. You don't have to pay a gym membership to use the sauna...now you have your very own personal sauna anytime you need it. Easy to operate. The portable steam sauna is very easy to set up, and all you need to do is add water and plug it in. It's that simple. Not high end. The saunas themselves are not the highest quality, so there is always the likelihood of a tear or a broken zipper. However for $100 you can't really complain. Need to be careful. There is a possibility of getting burned by the steam or the pipe if you sit too close. That's why a chair is always recommended. Your floor can get wet. As with any time you use steam, condensation can build up. As such you should always place a towel down under the pipe to ensure that your floor doesn't get too wet. Won't last forever. Unlike a traditional sauna that you will have in your home for 10-20 years, a portable steam sauna probably won't last very long, and if you use it regularly you'll likely have to replace it much sooner. At Sauna Talk we prefer the portable domes or the infrared units, but if you're set on steam there are a number of options out there for you. You have the cheaper ones at around $80-$100 and the better ones in the $150-$200 range. Those are the most popular portable steam saunas, and again you will find that there are many similarities between models. Oftentimes there will be a $50 price difference but the two saunas you are looking at will be nearly identical. So look carefully at the specs. It's very hard to duplicate the feeling of a traditional steam sauna, and the portable kind doesn't really come close. However, if you're looking for a quick steam without having to go to the gym or a spa, the personal saunas will do the trick. Make sure you read through all of the reviews carefully to see what customers had to say about the ones you are considering. That will give you a good idea of which ones are worth buying and which are worth avoiding. 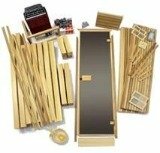 As these personal saunas are not of the highest quality, you'll want to be sure you are dealing with a manufacturer who you can contact if any issues arise. But again, for around $100 or so you can't expect too much out of these products.